I’ve been bad. And not in a good way. And sadly, that’s a much less exciting confession than it could have been. It’s all about the sour cherries. I went to Seville to get cherries a couple of weeks ago on an expedition well organised by my sister, Suzanne. 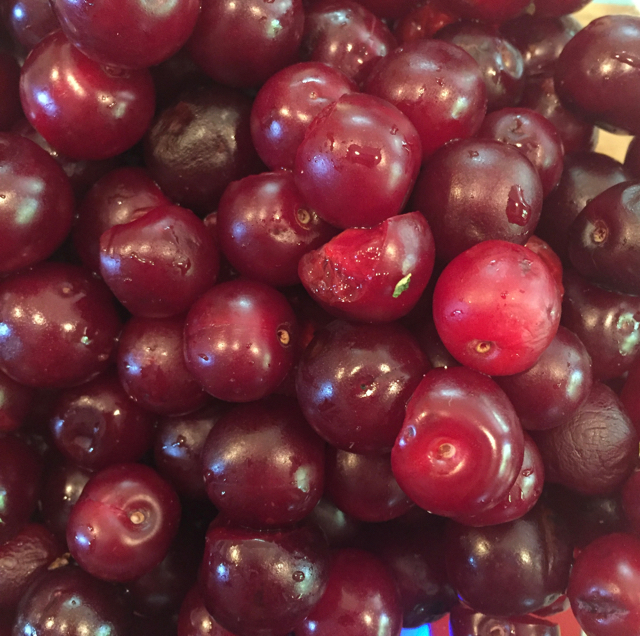 We came back with a host of goodies – gorgeous cherries, sour cherries, raspberries and blueberries. They all disappeared fairly quickly, except for the sour cherries. Which is silly, because they were the main reason for the expedition in the first place. Anyway, they sat in the fridge, just begging to be made into some magnificent dessert. But I haven’t been baking and they looked at me accusingly every time I opened the fridge door, looking just that bit sadder each time. Yesterday – it wasn’t hot for a change, and a little time on my hands – I knew it was now or never. I still didn’t feel like baking, so I decided on a preserve. Something that didn’t require me to individually pip them. 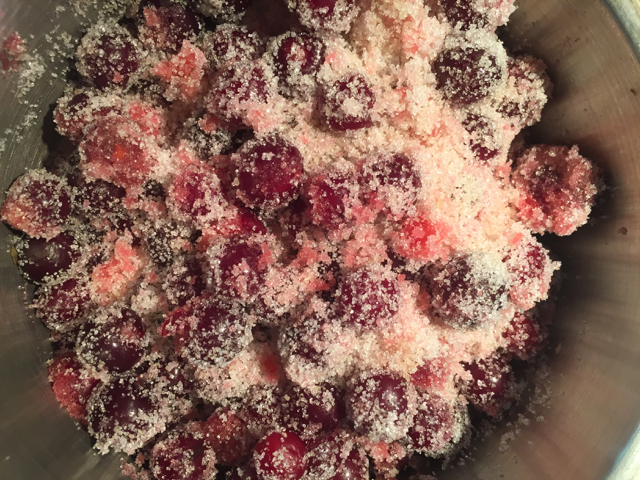 The online and cookbook literature wasn’t promising – they universally said cherries won’t set on their own, so use pectin. I didn’t have any, so it was clearly time to experiment. Just sugar and the cherries, no water. bits, and got rid of the stems, I had about 650g. Heat in a saucepan, just gently until the sugar liquifies, and then simmer briskly for about 20 minutes until all the fruit has burst. You can help it along with a potato masher. Put it through a coarse sieve into a large saucepan. Use a wooden spoon to push it through. You should be left with all the pips and some skins in the sieve. Add sieved juice of a lemon. Bring it to a vigorous boil, but watch it doesn’t boil over or burn, since it’s not as clear as a true jelly. I let mine boil hard for about 15 minutes until it started to show it was setting (the saucer-in-the-freezer test. For more details, see this post). I put it into small, sterilised jars and sealed them. 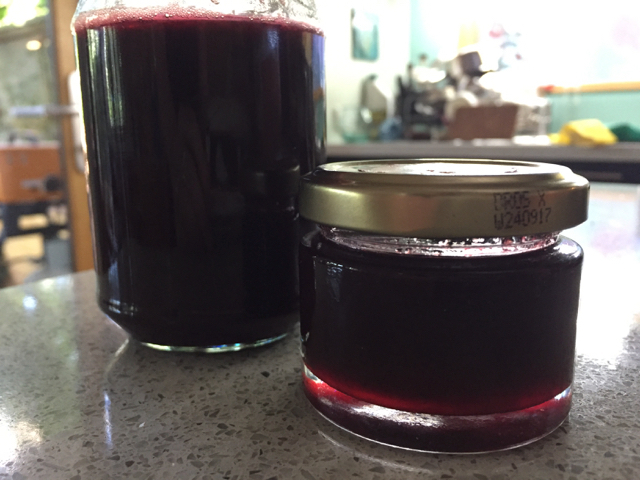 This amount made about 3 jars. After all the dire warnings, I kept my fingers crossed that it would set, which it did, though only just. But the taste and bright crimson colour are sensational. I can see it being magnificent on top of a cheesecake or pavlova, on soft cheese or with ice-cream. I had some today on bread and butter, and it was runny but magnificent. It was the lazy way out, but I’m not sorry.